The Uncertainty Principle is not difficult to understand. It is not weirdly spooky and beyond explanation. It does not involve electrons copying themselves, appearing in two locations at once, or somehow sensing our presence. The Uncertainty Principle simply states that, at quantum levels, you can not measure something without disturbing what you are measuring. I'm listening to tapes of physicist Richard Feynman lecturing to his CalTech students in 1962 on how quantum mechanics work, which, explaining in a thick Queens working class accent, he says operate totally unlike anything else you can imagine. Necessary to this explanation is a description of the law of quantum interference, in which an event that is observed has different properties than an event that goes unobserved. Werner Heisenberg coined the term "Uncertainty Principle" in 1927, as a way to explain why it is impossible to specify both the position and momentum of a moving electron at any given time. 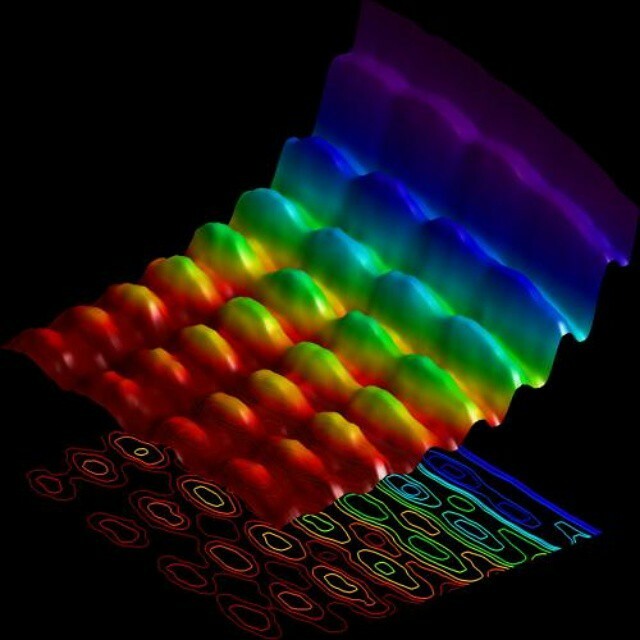 The need for determining the coordinates of electrons came about as an attempt to better understand why particles, when assembled en mass, can act like waves, showing interference patterns. Now, typically, wave interference patterns can be found when the output from two sources of wave-like energy, such as light, intersect. The two sets of waves, when they intersect, cancels out some waves and heightens others. Typically, with two adjacent sources of streaming particles, you will not see an interference pattern, just two adjacent bands of streaming particles. However, at the quantum level, two adjacent sources of electrons would indeed produce an interference pattern. The famed double slit experiment illustrates this by showing a wave pattern when electrons from a single source are shot through two adjacent slits. Even if electrons are shot out one at a time, so that they don't bump into one other, they still produce an interference pattern. But--and this is the weirdest part--they produce this pattern only when they are being observed, meaning the presence of each electron is recorded as it is observed. When their presence is not recorded, they go back to making non-interfering patterns. While many explanations conclude that the electron somehow knows it is being observed, Feynman doesn't go in for this mystical of an explanation. Instead, he talks about the effect that physical measurement has on the test. At these levels of precision, you can not measure something without disturbing what you are measuring. "Looking at electrons disturbs them. And the light waves we're shining on them as they come through, it is like hitting them with a hammer," he told the students. The photons are in effect hitting the electrons, changing their courses. "The light makes a big influence on the electrons." This interference isn't seen when measuring large objects, such as baseballs or bullets, because the effect of the measurement is so small in relation to what is being measured. It only becomes apparent at the quantum level. At first glance, one might have a number of solutions to beat this problem: Turning down the intensity of light used to observe the electrons, in effect reducing the number of observation photons. This approach reduces the number of electrons you detect though. Another idea: Elongate the light waves would improve the ability to detect the particles. This approach, however, though reduces the the ability to pinpoint its exact location of the electron. "It is impossible to arrange the light in such a way that ... you can tell which hole it went through, but at the same time ... won't disturb the pattern" he said. "No one has ever designed a way to beat this game, to beat the uncertainty principle,"
As a result of the uncertainty principle, physicists must be careful to explain phenomena in such a way that it either accounts for the influence of the equipment measuring the phenomena, or makes no statements about the phenomena in its unmeasured state. "This is the logical tightrope on which we have to walk if we wish to describe nature successfully," he said. "If you don't look don't say it has to do this or that; only when you look, and then it does."